"WE regret to record the death, on August 31, of Sir George McNaughton, a former chief engineer of the Ministry of Housing and of the Ministry of Health, and a past president of The Institution of Civil Engineers. George Matthew McNaughton was born in 1893, and was educated at Morgan Academy, Dundee. He studied engineering at St. Andrews University, where he took his B.Sc., and received practical training under the general manager and engineer of Dundee Harbour Trust. From 1914 to 1916 he served with the 2/2 Highland Brigade, Royal Field Artillery. In 1917 he became agent and engineer to S. Pearson and Son, and was associated with many large civil engineering contracts. McNaughton became an engineering inspector with the Ministry of Health in 1929, and in 1938 was appointed chief engineer, Department of Health for Scotland, where he remained until 1944, when he became chief engineer of the old Ministry of Health. His appointment was transferred to the Ministry of Housing and Local Government in 1951, and at the same time he became chief engineer to the new Ministry of Health. He was awarded the C.B. 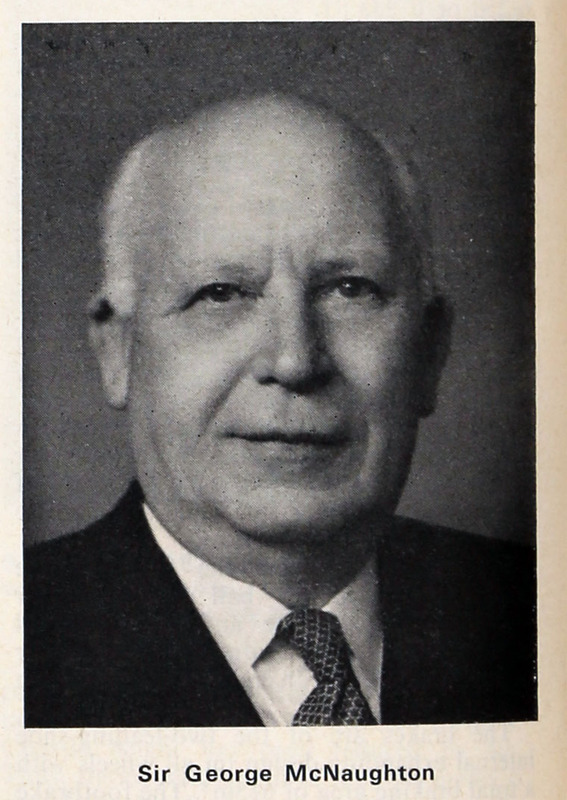 in 1948 and knighted in 1956. Sir George retired from Government service in 1960, but continued to be active as a consultant and as a director of two water companies. He was chairman of the technical panel which examined the possibility of building a movable flood-control barrier across the Thames. He was a member of The Institution of Mechanical Engineers and of The Institution of Civil Engineers, becoming president of the latter in 1961." Sir GEORGE MCNAUGHTON, CB (Member), who was Chief Engineering Inspector for the Ministry of Health in 1944, died last year. He joined the Institution in 1919 as an Associate Member, transferring to Member in 1939. This page was last edited on 4 July 2016, at 09:36.